Primula elatior, the English Oxlip simple yet so rarely seen in American gardens. If you want your garden to look like the hundred acre wood, this is the plant to seek out. Will you find it? Probably not unless you raise it from seed or join the American Primrose Society. It isn't rare. Just hard to find as commercial growers ignore it. 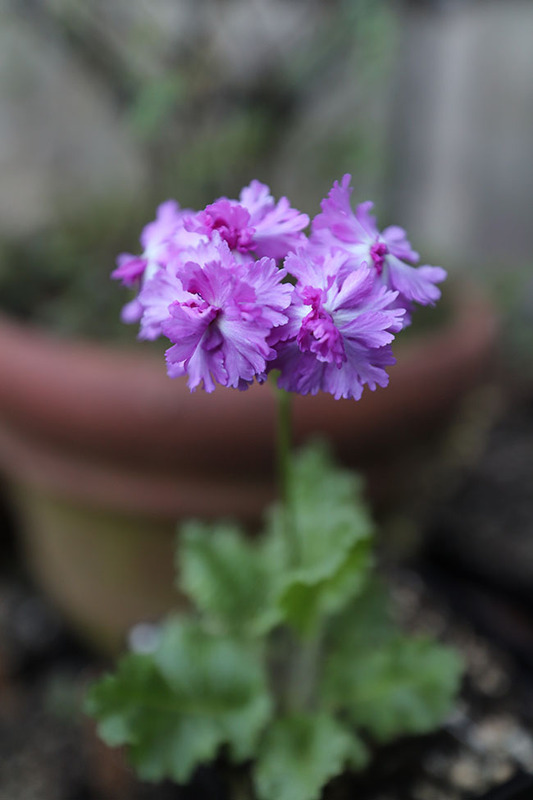 There is no Proven Winners Primula elatior. Popular in Shakesperian England, and still common there today. I grow mine from seed bought online from Jelitto in Germany. The easiest of all the primula, I think. 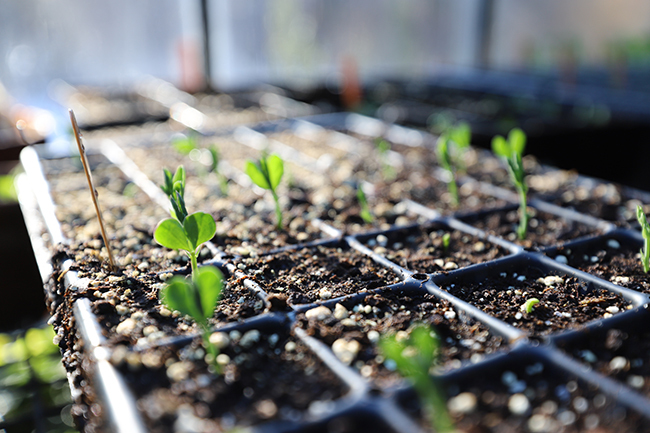 Sow indoors or under glass in February, grow on and set out in early summer and they'll bloom next spring. Very cold hardy perhaps to zone 4. or even 3. Gardeners love to complain about the weather. New Englanders love to complain about the weather, but this year, dare I admit that it is indeed the perfect spring, at least here in New England, and at least, for the plants. What is 'a perfect spring'? A long, slow and gradual thaw (with no surprise freezes which here in the Northeast still can happen until mid-May) and few extreme fluctuations. I can add no drought, although we are about 2" over our average rainfall. With all of this, the native plants are emerging slowly and steadily, and the imports (remember, so many of our ornamental plants are Asian) are gradually opening up. The giant Butterbur or Petasites japonicus ssp. giganteus just emerged two weeks ago with cobs of purple flowers. Now, a couple of weeks later, the flowers are extending upwards and the giant leaves - which will gradually expand to nearly 3 feet across, are all on schedule. Last week I spoke in Denver at the Denver Botanic Gardens for two days. - landing in snow or what they called a Bomb Cyclone, our plane was the last to land before they closed the airport, and what I experienced is very much the sort of spring we usually get here just outside of Boston. That would be a spring with surprise snow storms, ice and freezing temperatures that make mush out of magnolia flowers and bend over even tulips and hyacinths. Here? The primula species are emerging just as if they were growing in the Himalaya, or in the French Alps. 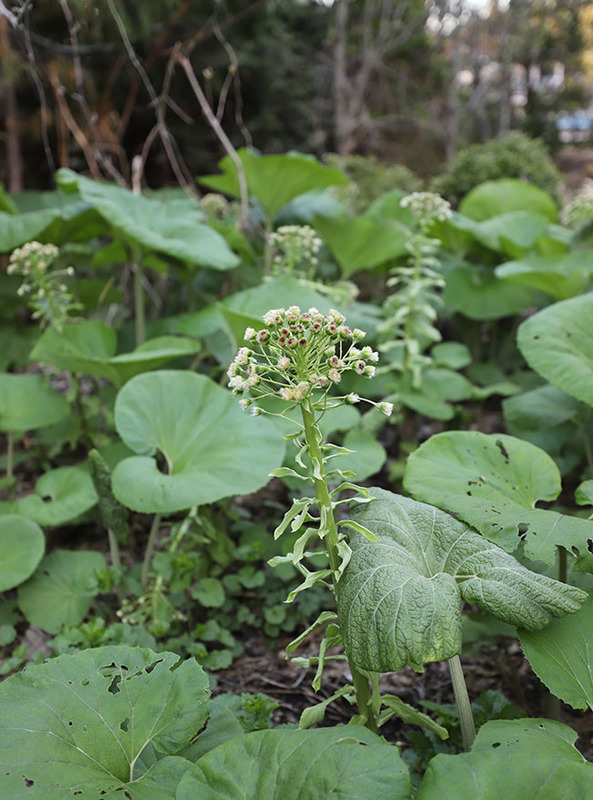 The Asiatic species of garden perennials like the Rodgersia, Lilium and even the Petasites japonica are coming out of the ground and blooming later than normal, but nice and slow. The way it should be. I am always picking up rare plants at plant sales or getting some as gifts. Here is one I completely forgot that I had (and there are two clumps!). Galucidium palmatum. Sometimes it's just nice to see everything before it opens up. 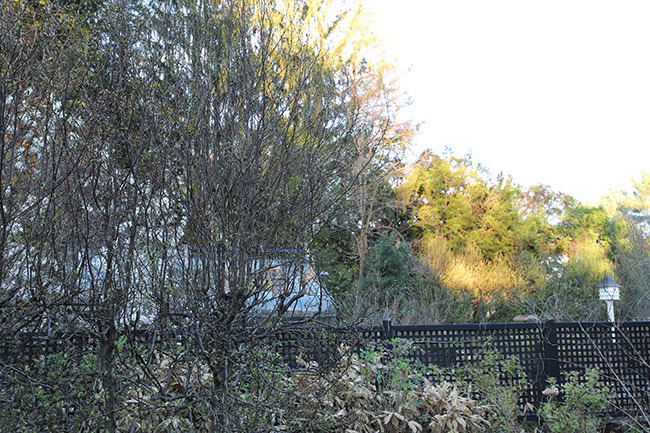 We had a mild winter here in Massachusetts but that didn't help our rampant population of bamboo which has become so invasive. This Sasa veitchii (the brown leaves at the bottom of the image) is now everywhere in our garden, and with culms and roots that reach down deep (nearly 2 feet) I cannot get rid of it. I am open to any suggestions. Please. 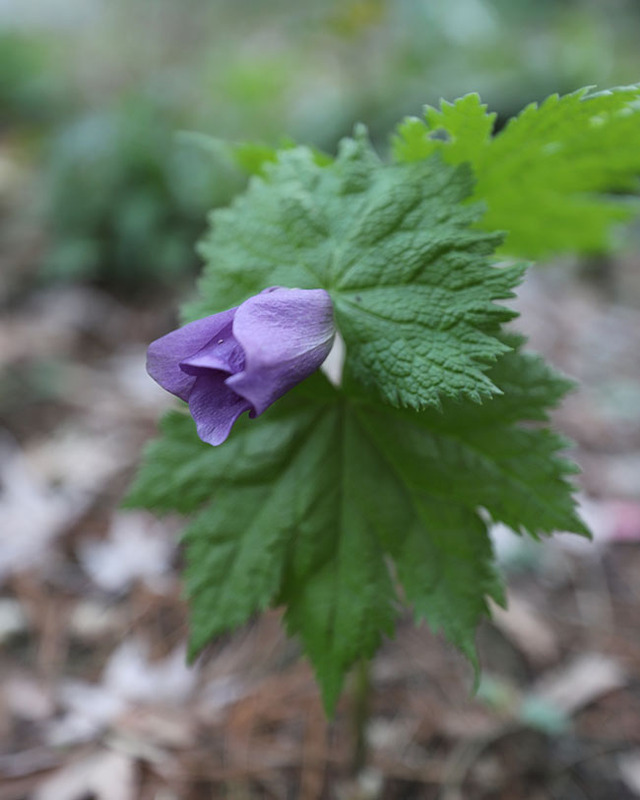 While often challenging as a bulb plant, the mostly native North American Dog'sToothViolet can be highly collectible and highly challenging. But this one isn't. 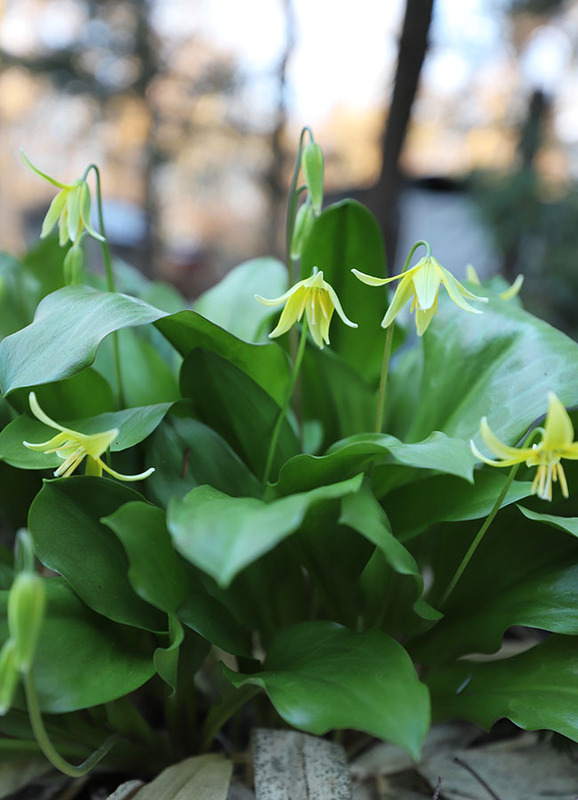 Erythronium 'Pagoda' is a commercially (Dutch) grown common selection that is hardy and easy. You can get the look of an alpine meadow in the Cascades without spending 35 dollars a bulb. I know, I know. 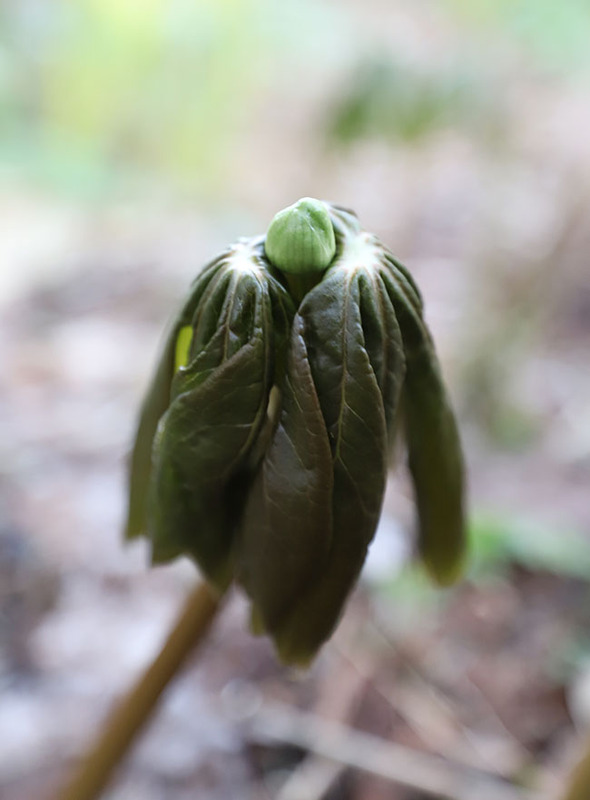 Lots of invasives, but this native Podophyllum peltatum, our local and family Mayapple, is always a welcome sight in the spring. It never grew here on our family property and woodlands, but it was from a clump in a wild colony that Joe and I found back in the 1980's near his parents' house in Northborough, MA. Seeing it always reminds me of him digging a bunch and filling up the trunk of my new 1984 Fiero. Shut up. We're all native now. 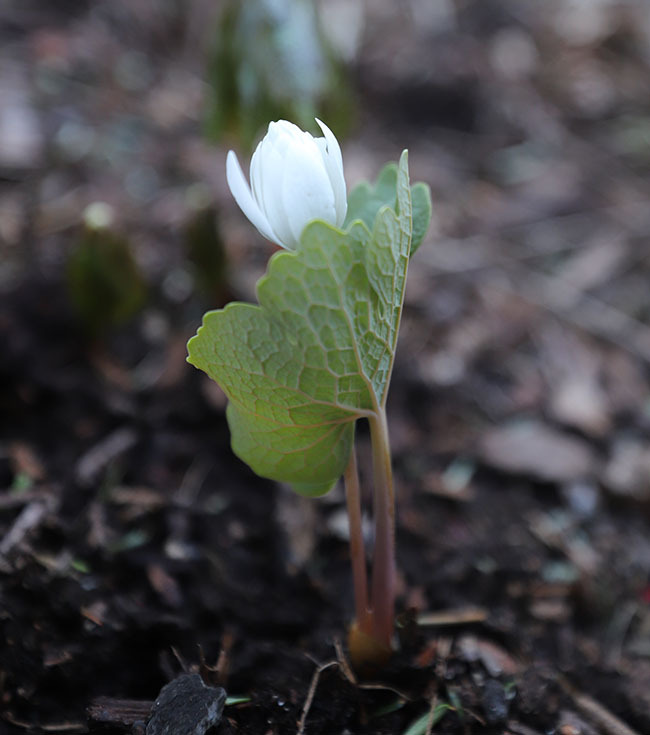 Our native bloodroot, Sanguinaria is often overlooked for the fancier and showier double forms, but this one - again, from a wild-collected stock that I got while I was in College at UMASS. Of course, in the late 1970s and as a 18 year old, digging something from the wild wasn't frowned upon. In fact, our professor encouraged it. At least I still have the colony. I guess digging from the wild is a theme here. Clearly don't do it boys and girls. Never dig in the wild. I was kid and not very responsible. Plus, I was a plant nerd and there was no stopping me. We now know better. Protecting our native and wild populations is what we are all about. Really. Still, there is a story here. This was collected by Joe and I around 1987 when we lived in upstate New York near Tuxedo Park and I was working in the city. 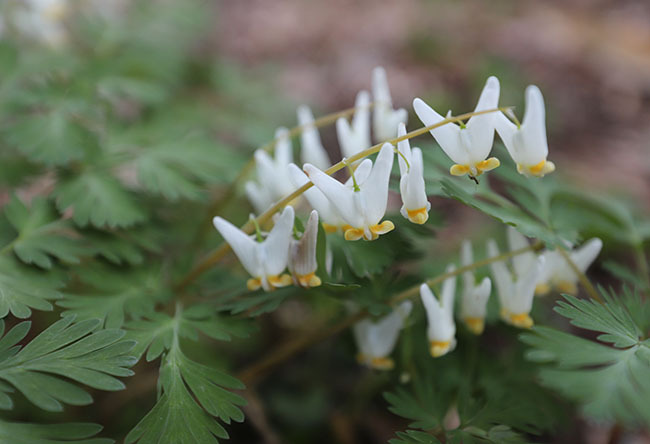 Dutchman's Breeches or Dicentra cucullaria was running all over our property. Now, this population has spread throughout our woodlands. Epimedium. 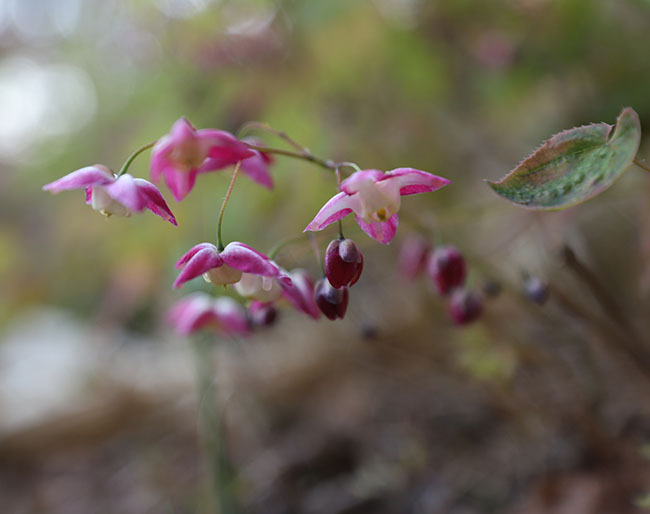 This one from my friend Darrell Probst is from western China, but I include it because in today's gardens we often combine wildflowers from similar climates elsewhere in the world. Collected? Yep. But carefully propagated from seed not plants, and just like our diverse human population, our gardens can and often are just as diverse. Even though I've been very busy with my new job in Boston, I need to be creative in finding any free time as I am still speaking on most weekends on my book tour. Not to mention that I am writing another book which has had to have it's deadline slightly extended (no worries, it will still come out next February). A book a year. - that's my goal. 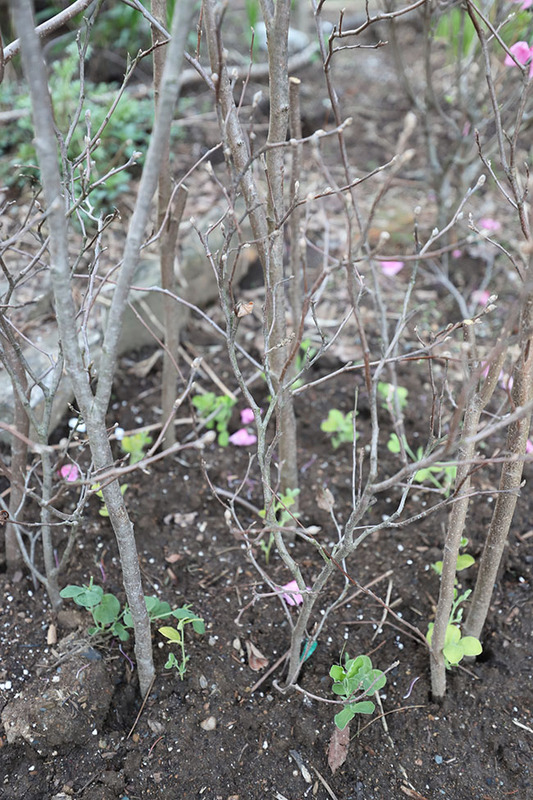 Here, English Spencer Sweet Peas are set out into the garden, this time in a column of pea brush (fothergilla). I chose 6 shades of purple and blue for this collumn. Curated colors look best. I'm growing many annual poppies again, but remember -Irish Terriers rule the land here. 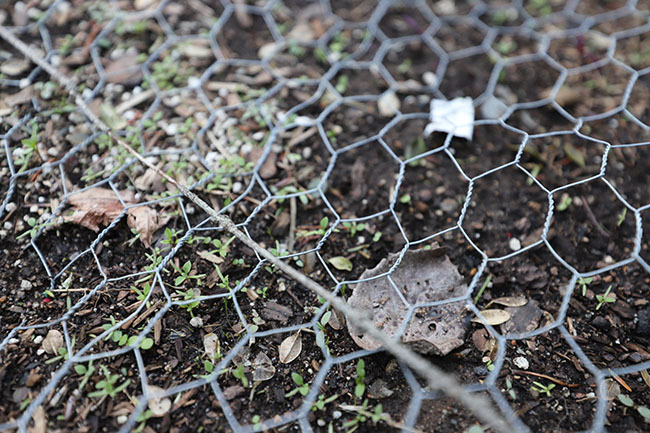 I am being clever and using chicken wire and netting to keep these tiny seedlings safe. Sown a few weeks ago just as the snow melted, these Shirley Poppies were sown with sand and seed mixed together, and then sifted through a kitchen sieve onto lightly raked soil. They look big here but believe me they are tiny. This lot will need to be thinned soon, with the excess tossed because one cannot transplant poppies. The classic Matt Mattus shot, right? I need new props. Oh...I. bought one - look in the photo below and see if you can see the new flat black Haws English watering can from Terrain. (it was an exclusive and limited edition color!). 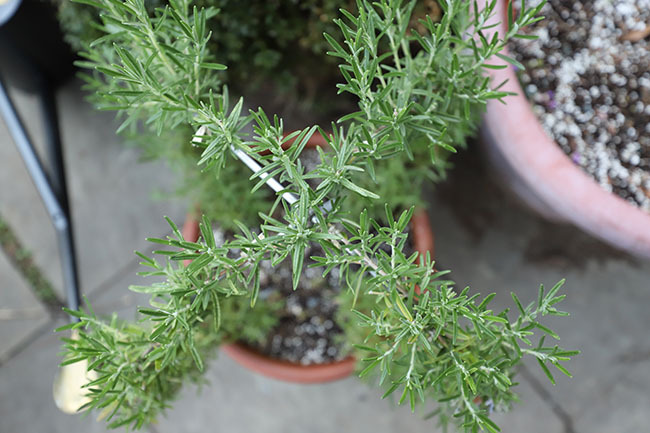 Last year I started training some red-flowered rosemary into globes using armature wire. They are looking fine now. A classic English method that one can see at Great Dixter, and now here in Wormtown, MA. 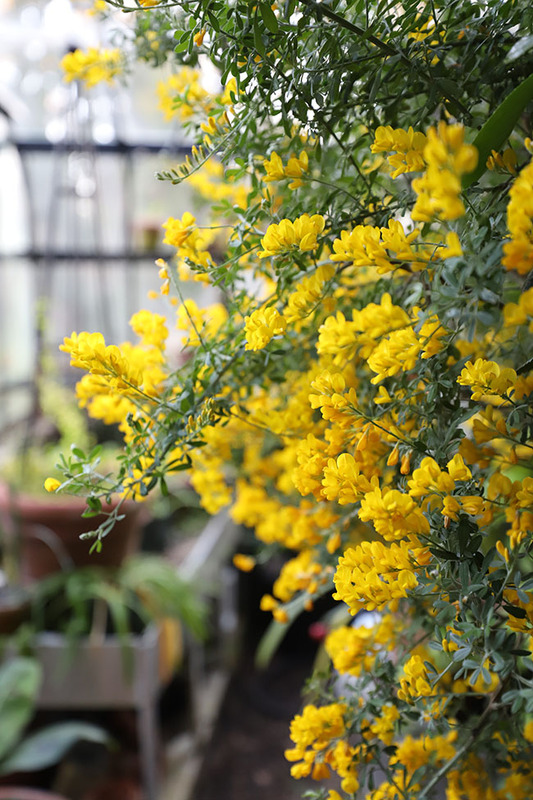 Oh, Genista canariensis. You make the greenhouse so lemony! Really - true story. For my entire life, I could never smell this but Joe would always tell me that it scented the entire greenhouse with a rich lemon Pledge furniture Polish scent, yetI could never smell it. At all. Nothing. Yet, this year? I can smell it. Weird, right? Although, I would say that it smells like lemon scented Lestoil floor cleaner. Not exactly a yummy lemon flavor, but still somewhat an artificial lemon scent. My pots of what are some of my most favorite bulbs. 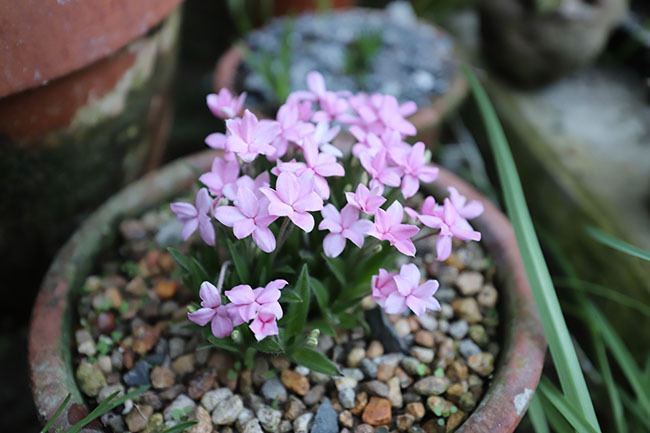 - Rhodohypoxis baurii are beginning to bloom again in the sand beds inside the greenhouse. I am growing many hard-to-find annuals this year. Flowers that one can rarely find anywhere (mostly for my book, but many for clients who might be interested in trying some). This Malope (in the hibiscus or mallow family) should be lovely with bright pink, wide flowers all summer long on bushy plants. A bit of rarity and joy. Agepetes blooms on some very long and vine-like branches. I've been waiting 2 years for this to bloom. 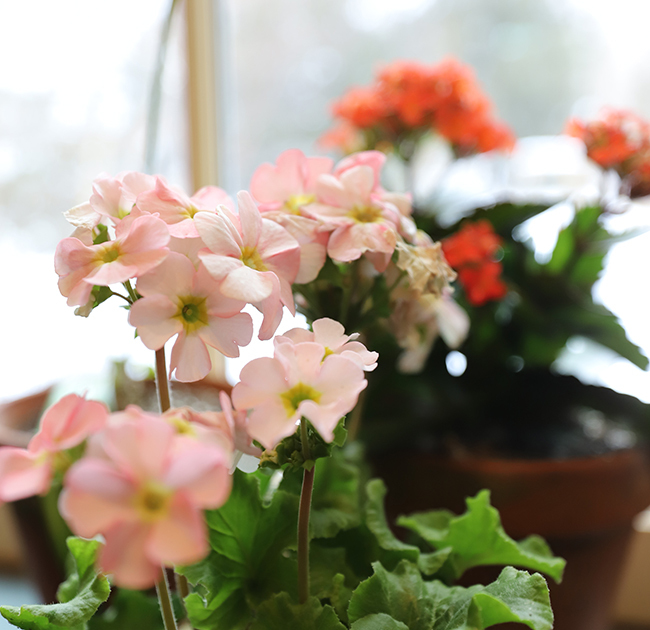 We acquired some very rare Primroses from Japan. 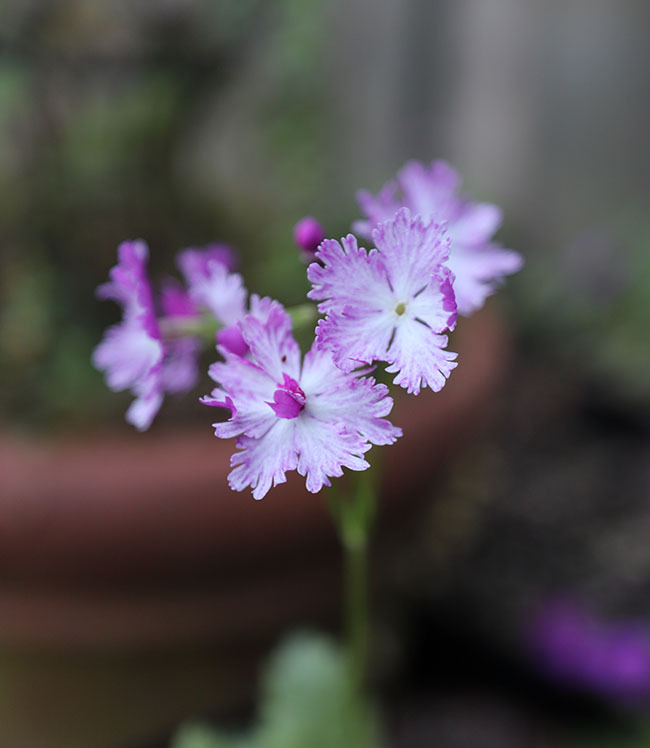 Primula sieboldii is hard enough to find, but these are very special and while I can't say too much about them as the grower made us promise not to sell or share them (they are very precious in Japan), I felt that I could show some here. This double is called 'Elegant'. This double with an odd flower is named 'Maimomiji'. I think we have about 60 but they are small, and I am waiting for the others to bloom. There are so many nice begonias available now. I zipped down to Logee's last Friday to stock up for myself and clients for summer containers, summer porch displays and,well, OK, yes, for myself too. 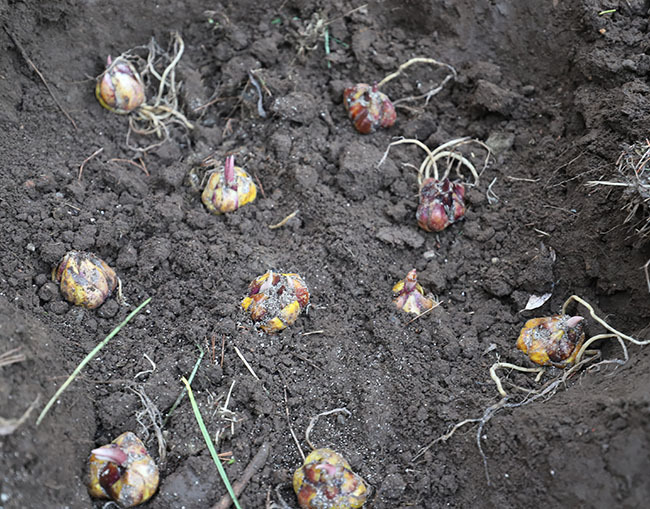 Lily bulbs are beginning to be shipped in spring as well by some lily nurseries. I had been looking for the large, orange and rust colored trumpet lily named 'African Queen' and found a (secret, sorry) source. I ordered 20 bulbs for one giant clump. OK, I got them from the Lily Nook, in Canada. They ship to the US, but typically in late autumn. 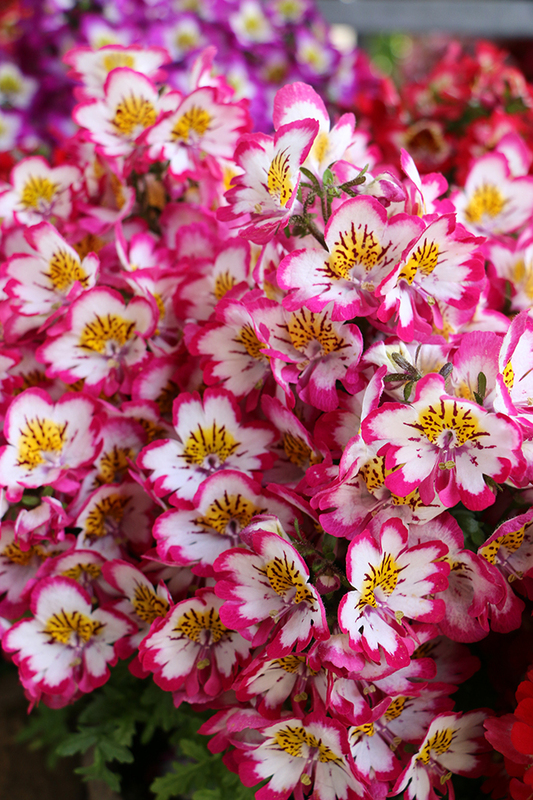 It's going to be a fragrant summer! Trumpet lilies can grow 6-7 feet tall with many blossoms. Planted in clumps of 10 or 20 (as they grow in the wilds of western China) is how they look best. Extravagant?Maybe, but they take up about the same space as a hydrangea does but who in your neighborhood does this? Imagine how it will look! New spring. growth on pomegranate trees in the greenhouse emerges very early, even have a freeze. It's often our first sign on spring. Trees can be kept on a very cold porch or even in a garage bare all winter and rather dry if the temperatures don't drop below 20 degrees. Their new growth always looks fresh and like April (but in March). While there are great things to say about the democratization of design, retail stores - the whole 'Target' thing, and how today even garden centers and plant producers are bringing us more and more choices with branded plants and amazing products in nicer sizes and early enough plant, that in many ways we are better off than our parents were. But then again, if you are like me, you go to the garden center and peruse the aisles at the big box store where there are only circus colored pansies or weird combinations of colors that I frankly wouldn't buy. 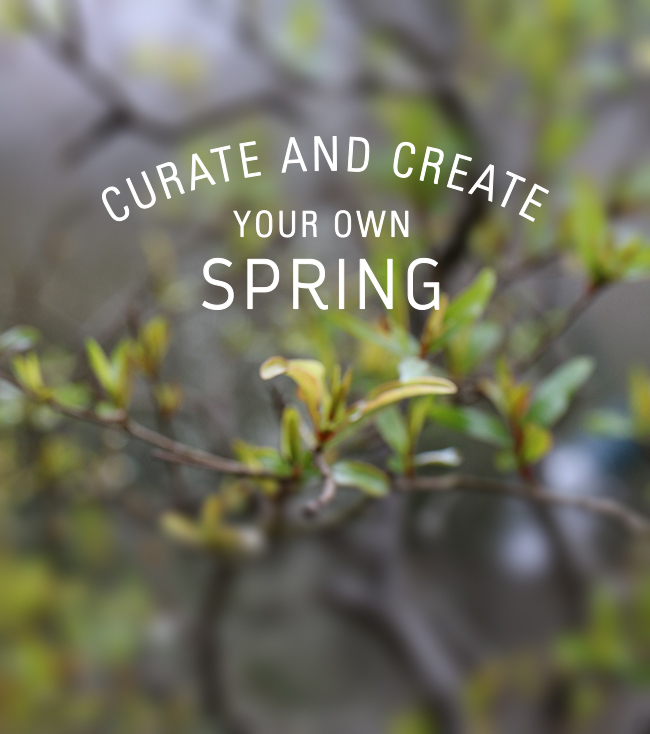 When it comes to designing your own spring containers, sometimes a little creativity and forethought will go a long way. If you settle for convenience, you may just end up with containers that look lovely, but with ones that look just like everyone else on the street. 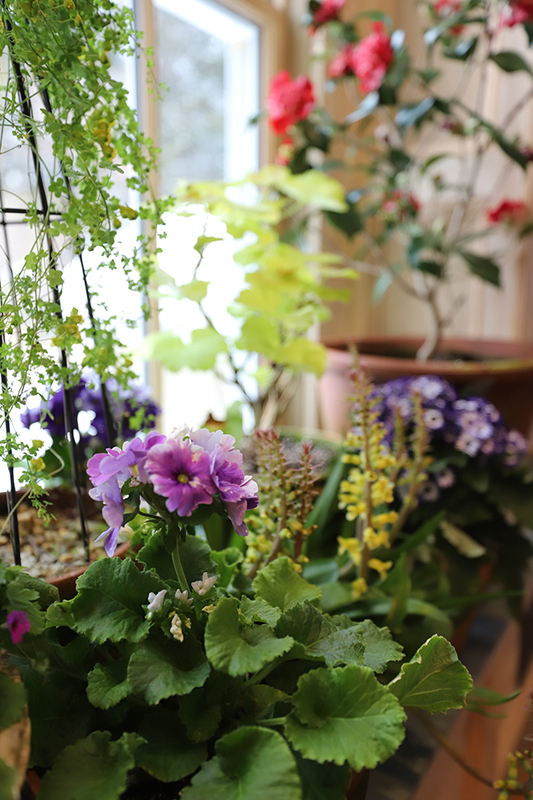 Our new plant window and library window is still under construction (I still need to decide what color to paint the woodwork) but I had to bring in pots from the greenhouse for some well-earned spring display. 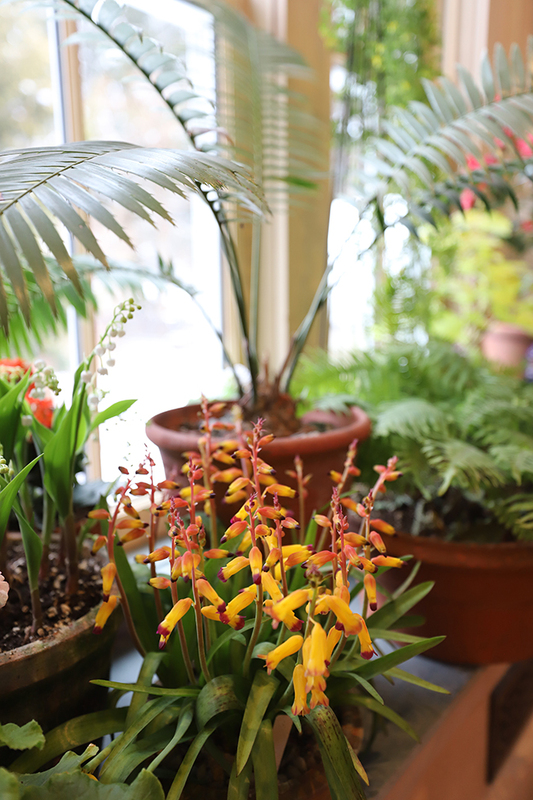 Lachenalia, Cape Primroses, rare ferns, camellias and that palm-looking plant which is a Dioon (cycad) in Guy Wolff pottery really helped me feel good about the delay with the window seat. I had it covered in green Brazillian slate so that heavy pots could be set on it. The system is simply set up that way, with so many evaluators along the way that by the time a pansy or succulent shows up at your local nursery - the palette has been edited - often by criteria such as cost, your economic zone where you live or by someone who frankly (I'll say it) doesn't have a great aesthetic. It happens everywhere, but I think more so in the plant business. The person making the decision to buy 2000 flats of pansies may prefer double, brilliant yellow or bright purple over the newer introductions like bronze, brown or tiger striped. It's just a matter of taste, but as we all know, taste is a subjective thing. 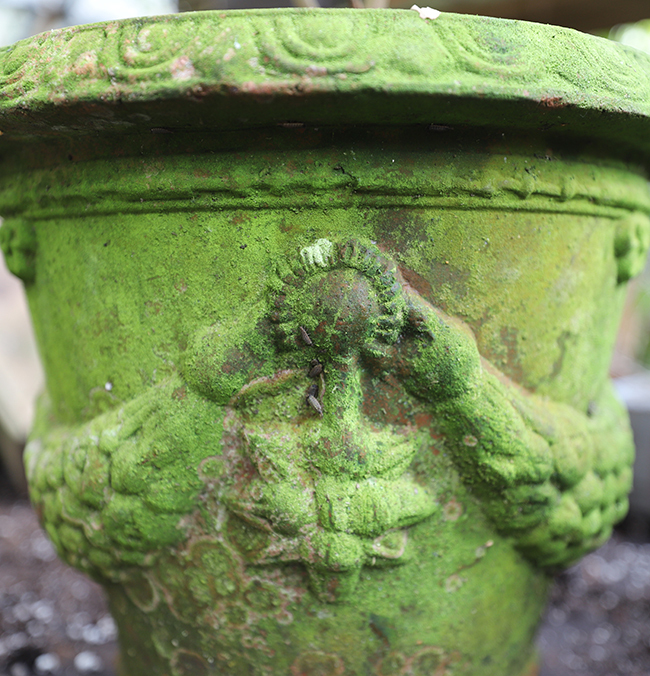 Spring in the greenhouse means moss on the pots. Which many love visually (me too). Of course, it's not always a good thing as pots must be washed with a bleach solution each spring to sterilize them - but don't try telling that to interior designers who love the look. Must like moss in the garden, it just grows where it wants to grow and no one can force it to grow where it doesn't. I think I know a few people like that! But there are plenty who keep trying to promote moss as a design element even if it can't be forced to grow. Indoors and outside spring is slowly coming on here in New England. This year it's been a nice, slow spring which is great for the plants, but not for impatient gardeners. Our snowdrops are just emergins as are the crocus and other early spring bulbs. There are those years where they all bloom in late February, but this year, it's more typical if not normal. 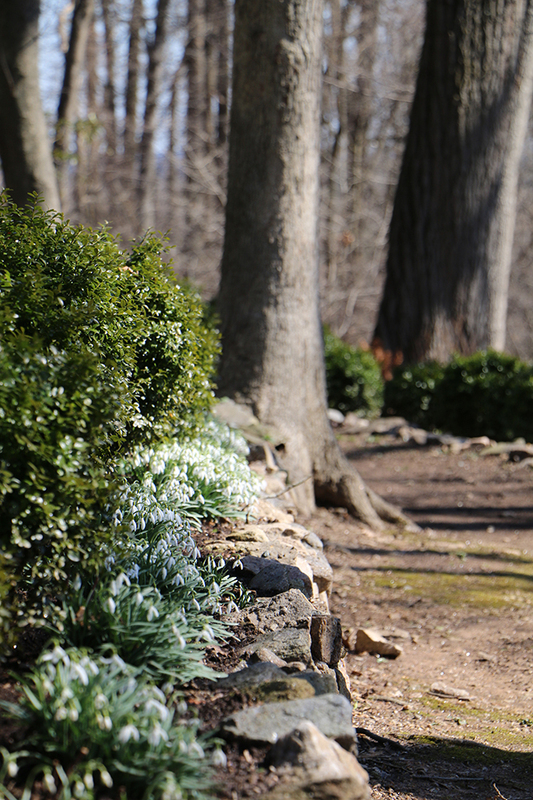 Snowdrops in this Maryland gardens that I saw last week were all in full bloom, but this is when they should be divided as it is easy to dig and separate clumps into smaller clumps to speed-up division. 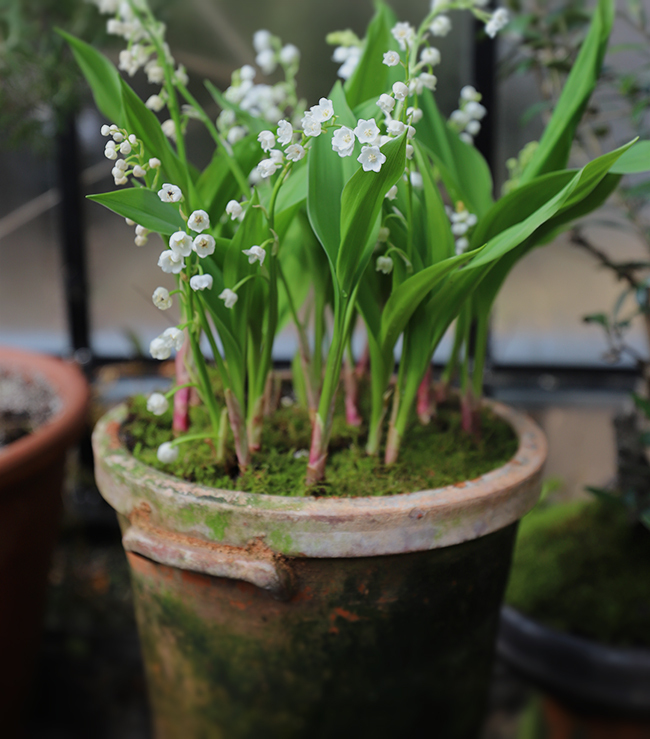 This grower started with just a few bulbs 30 years ago, and now her woodlands are full of flowering clumps. So lovely under the deciduous trees, which is what they really enjoy. 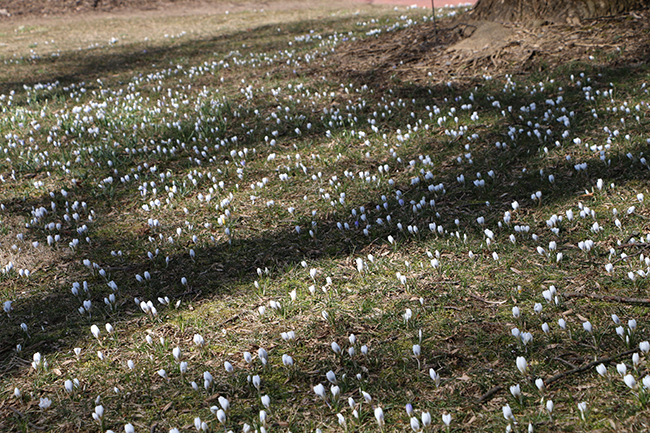 The lawns are Longwood (near Mr. DuPont's house) were planted with thousands of crocus and eranthis. The trick here, as we have a crocus lawn in the old golf putting green that my parents had installed in the 1940's is to use freshly dug bulbs if they are eranthis, which are difficult to find, and as for crocus, avoid the large hybrid Dutch varieties and opt for a species type or Crocus. tommasianus selections which is by far the finest species to use. 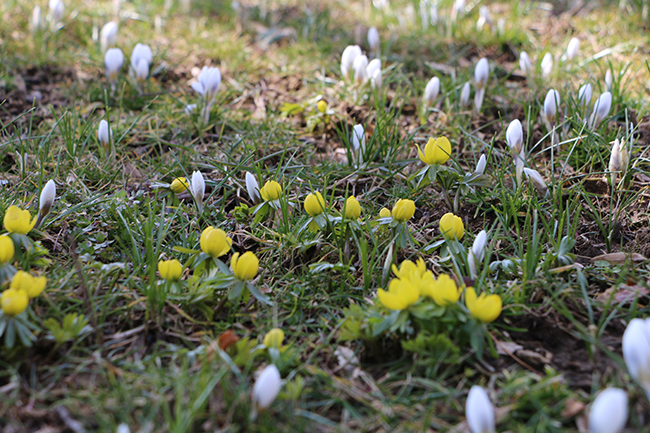 Crocus Lawns should be raked and thatched very early or you risk damaging the flowers. 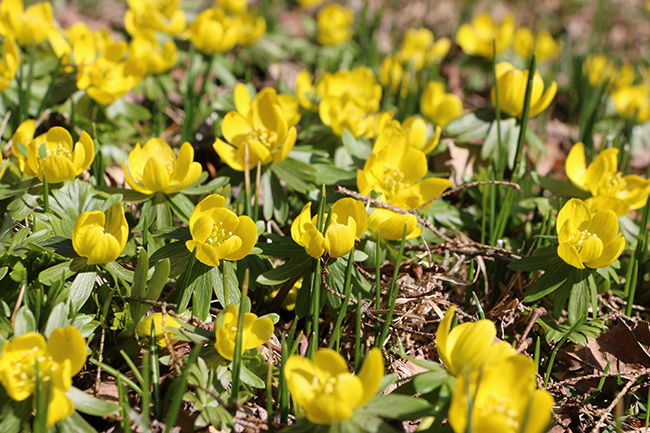 Eranthis hymalis - the winter Aconite -will self seed and spread if fresh bulbs are planted in the fall. Find a friend who has some or dig and spread around your own if they are self seeding, but it may take time to get good stock that isnt dead when you order it. 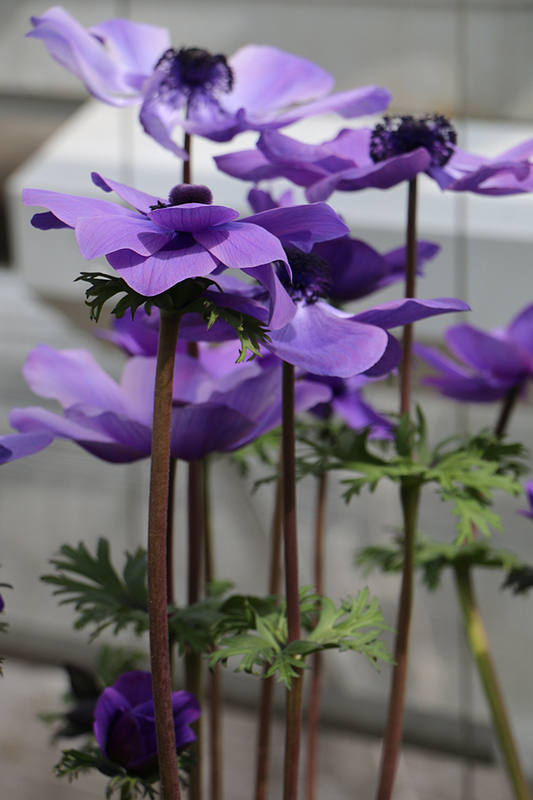 Anemone's (the dutch sort like these) and commerically raised ranunculus are the darlings of the internet and local flower farm movementm, and whille you will see pots sold at garden centers, if you winters are cold and the ground freezes dont expect them to return. Treat them as annuals. 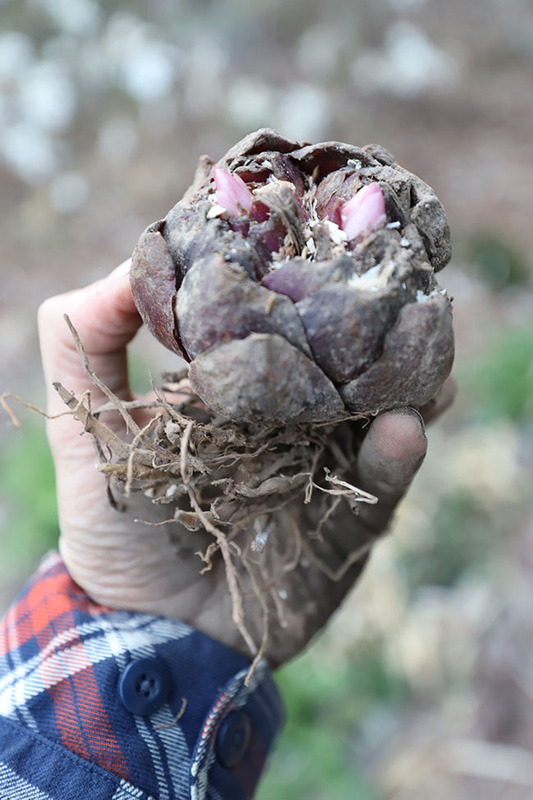 While cold-tollerant, if you buy corms in the fall plant them in a hoop house or a cold greenhouse and you will be rewarded with early blooms in spring. Beyond that, enjoy the ones you buy for early spring containers and dont worry about it. Indoors you all know that I am a big fan of Cape Hyacinths, or Lachenalia. The newer hyubrids like these African Beauty strain varieties are so easy to grow (if you can find the bulbs in the fall) that they should have replaced paperwhite narcissus in popularity, but sadly, few know about them. I like that they were far more popular in the mid 19th century than today. 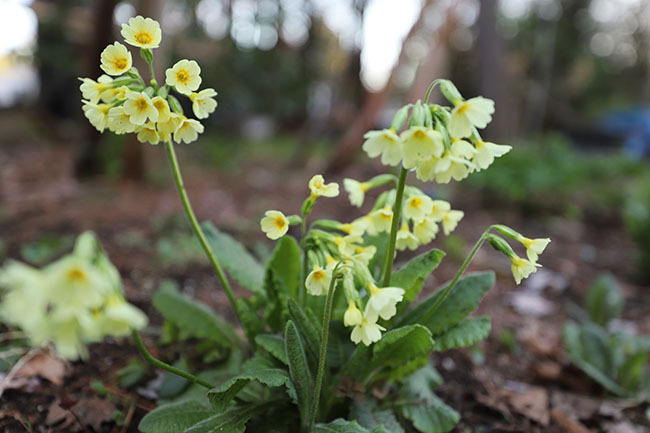 The old fashioned winter or greenhouse primroses like these Primula obconica were once so popular (They still are in Tokyo) but here? Forget about it. Old catalogs from 1910 show pages and pages of them for early spring color in windows and containers, and their color palette of apricot, periwinkle and coral is so on point today, but few growers offer them. 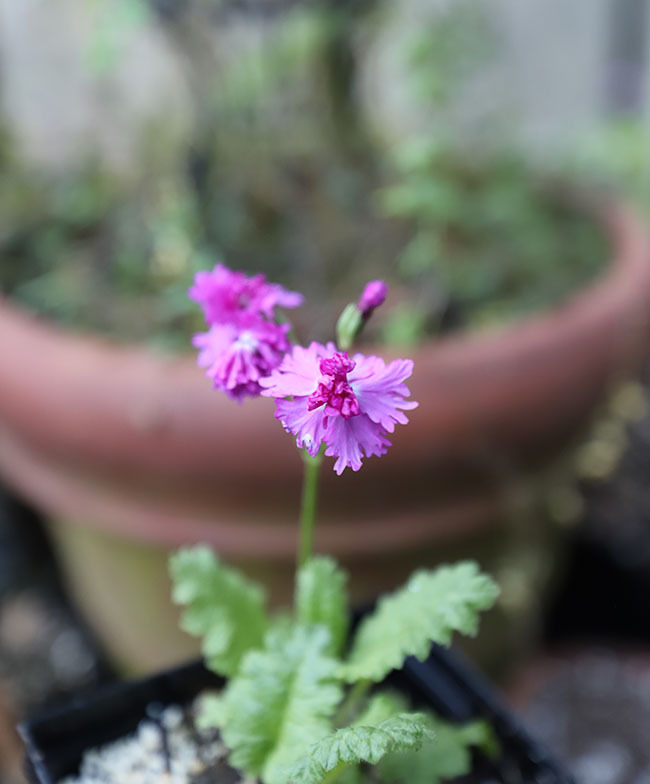 I know - Pacific Plug and Liner even offered the almost extinct Primula sinensis but buyers and agents are not familiar with it or they feel that consumers wont be familiar with it, so they rarely offer them to clients. Another view of my new plant window. Later I will share more photos, and yes - more Primula obconica. Another flower in spring that has completely falled out of favor is the Schizanthus. I have a 1920 catalog from Suttons in England that has 5 pages of seed varieties but who today has a greenhouse or staff to grow these for their conservatory? Then again, who has a conservatory? But wouldnt you love these "butterfly orchids" in your home or spring containers? Just try to find them though., I've only seen them grown well three times in 30 years. First at Butchart Gardens when I was kid in Vancouver while visiting, once at Kew in the year 1999 and then last week at Longwood. Yes - I grow them myself from seed and I have a few flats ready for special clients, but beyond that, good luck. The color palette of Schizanthus varieties is varied and odd, and maybe not for everyone, but they sing for me. There are wild and a couple of species forms from seed available. which are better in the garden but they must be raised from seed at home. A few commercial strains exist, that a handful of capable growers to grow regionally, but these cool weather plants would surely be marketable if only people knew about them. 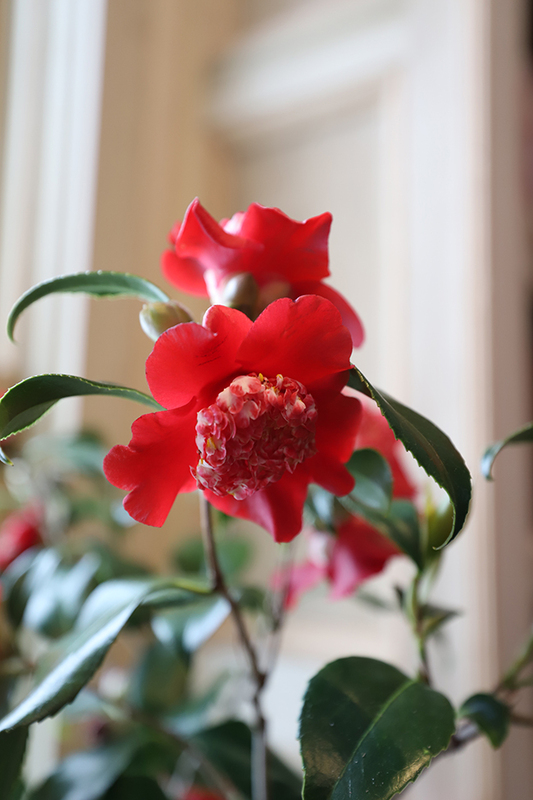 Check out this camellia I brought into the house last week. The anemone form is so rarely seen, but what a show it puts on. FYI - My English Spencer sweet peas are growing fast. - especially those for friends and a handful of special clients. I am growing 62 named varieties this year. More than ever, but there are never enough, right? Iam gorwing pots of dwarf sweetpeas this year. - all white vintage varieties and some pink. Just a trial, but they look great so far. Most of the truly dwarf varieties from 1900 are lost so tracking some down was a surprise. 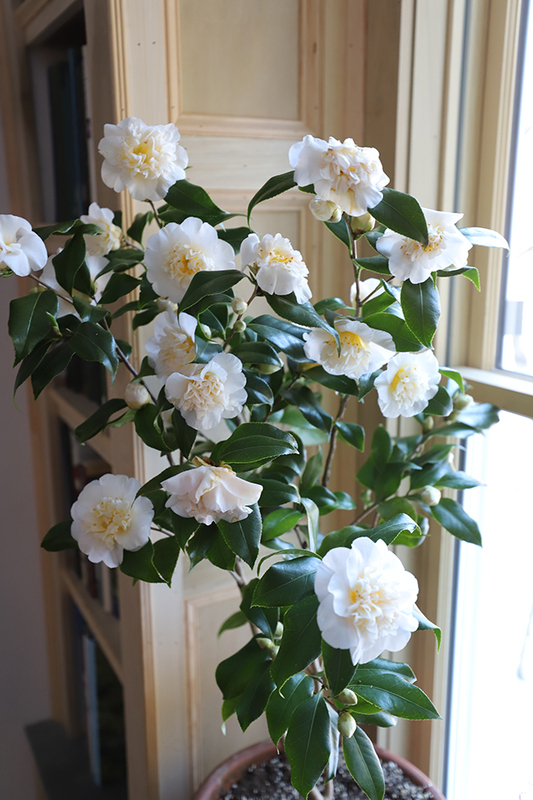 Also in our new plant window is this pretty pale yellow camellia. 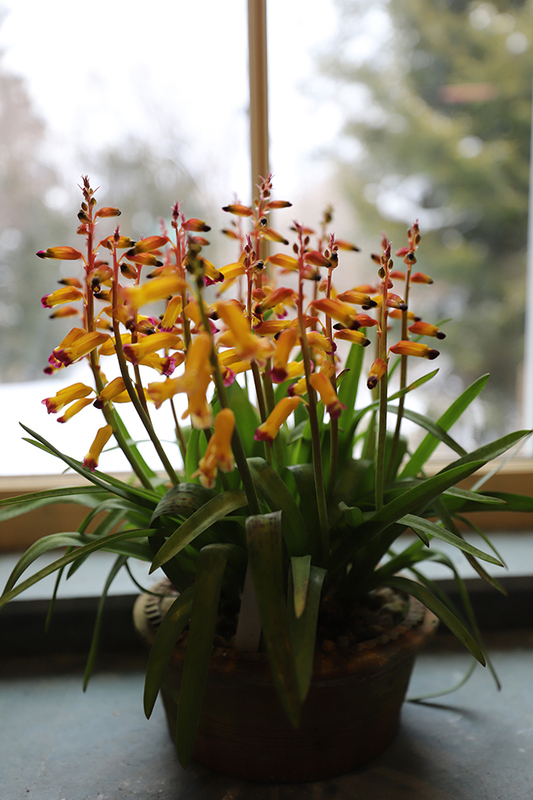 So floriferous, but it only comes in while in bloom then whisked back out to the cool and buoyant greenhouse. Got a heated porch or a bright garage window? A mudroom that is cool? Then this one may be good for you. It's citrus season here in New England! At least, in my greenhouse where at least 10 varieties of citrus can be picked on any day in February. While easy to grow in a cool greenhouse, indoors, citrus need a little extra special care - here are my tips. I'm often asked about how to grow citrus indoors or how to grow citrus in containers - and while I am hardly an expert on raising citrus fruit, I have been growing many citruses in pots since, well, when I was a kid. Really. Here's a secret - my very first houseplant grew from a sunflower seed one of my mom's flower pots, but my second was a grapefruit tree that I germinated and kept growing into a thorny beast which my parents gave away (or threw into the compost pile) when I left for college. 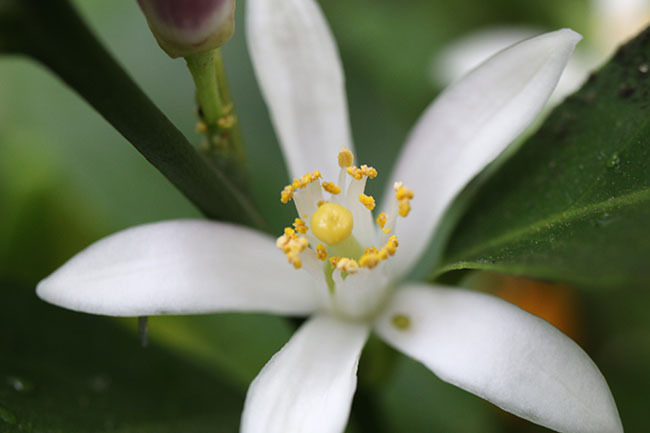 If there is a single reason for growing any citrus indoors, it should be for the fragrance of the blossoms. I think citrus are great plants for many to try indoors, but they aren't foolproof, nor even 'easy' as many will claim. Young plants are easy to obtain, even from seeds that you find in a grapefruit, which is a good project for children to learn. I myself remember how excited I was when I germinated my first grapefruit plant, but I later learned the realities of getting citrus to bloom and fruit indoors and how it requires a grafted plant of a named variety. No need to ruin the dream for the kids though, they already are having a blast with their science project and who knows - you may have a budding botanist in your future! 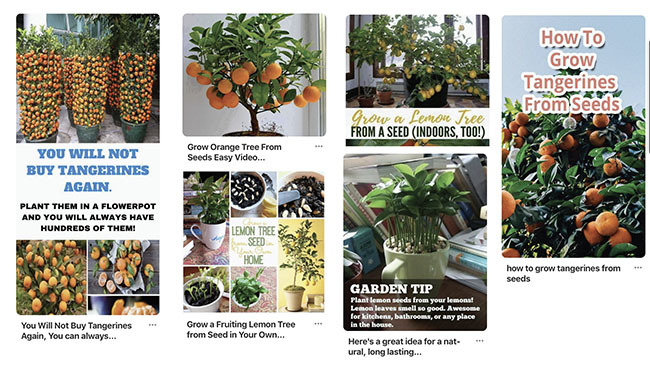 Meyer lemons thrive in cool greenhouses and cool rooms indoors, ideally, they should bloom in June and the fruit will mature in winter - just when you would want them! Australian finger limes are very fruitful, but also very thorny so be prepared, especially if you have kids! A few facts up-front though, especially if you want to have fruiting citrus indoors. 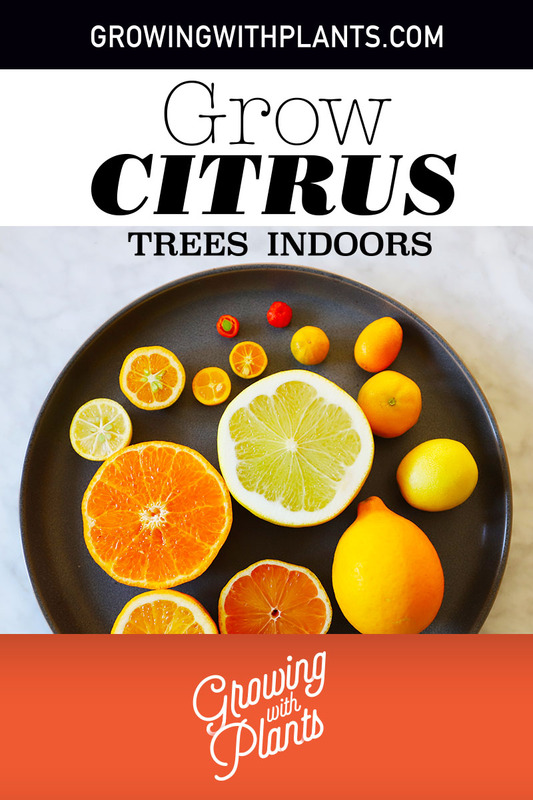 We should work through all of the facts and misinformation out there about citrus indoors before you undertake your own dreams of winter lemons and oranges. First, sure you can plant seeds of most any citrus (I just said that I did, right? I encourage it - but know that this is just a fun science project and that your hard work and years of dedication will most likely result in a thorny shrubby plant that won't bloom for a decade or more, and when it does, the fruit will most likely be inedible. Some citrus I picked this past weekend in our Massachusetts greenhouse. 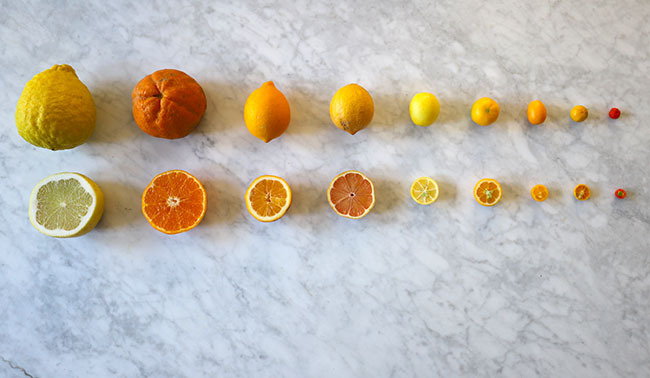 )Left to right) Ponderosa lemon, a Mandarin orange, 'Improved Meyer Lemon', 'Pink Variegated Lemon', a Limequat, a 'Fukushu'. 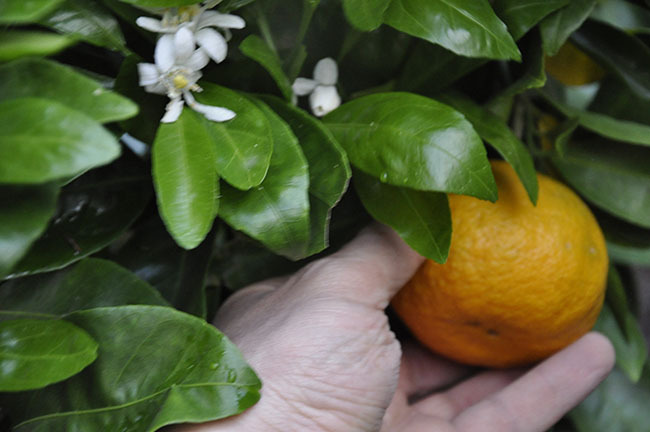 kumquat, a Sweet Kumquat, or 'Meiwa' kumquat, a variegated Calamondin and last, the tiny Hong Kong Kumquat. I think before starting a citrus farm indoors, you should decide what you want. Do you want flowers? Decorative fruit to remain on the tree all winter? Or do you want to actually pick fruit and use it? Sure, one might say that they want it all, and yes - you will get blossoms anyway, but not all citrus is the same. Let's go through the list of popular citrus that you can buy and see what is most growable in the home, or in a greenhouse. 'Mandarin Orange' which includes those sold under the name of 'Cuties', 'Clementines' or any of the classic varieties like Tangelo - these oranges are all related, have east-to-peel reticulated skin and are delicious, but they are more challenging for culture indoors. Forget about starting seeds from those clementines and getting oranges in the house on your windowsill. It's fake news. A nice mandarin orange freshly picked from our tree last year. 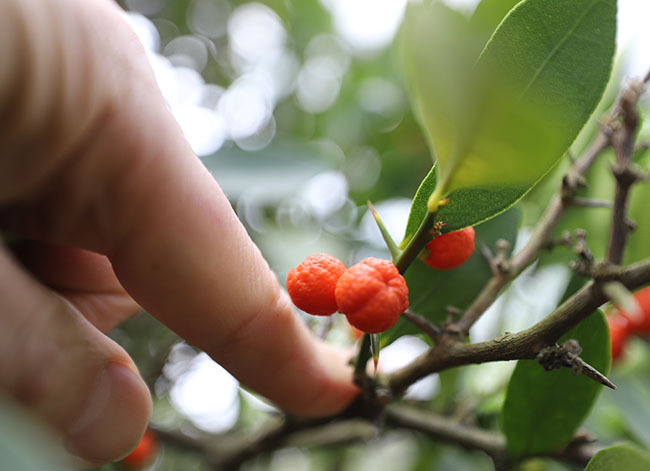 There are named varieties of some Mandarin types, which you should seek out - Logee's Greenhouses in Connecticut carries some but between you and me, unless you have a cool room to grow them in, they are better for cold greenhouses. These varieties produce delicious fruit, but let's be realistic - the trees grow larger than most citrus, and are more difficult to grow well indoors, at least in the typical North American home. 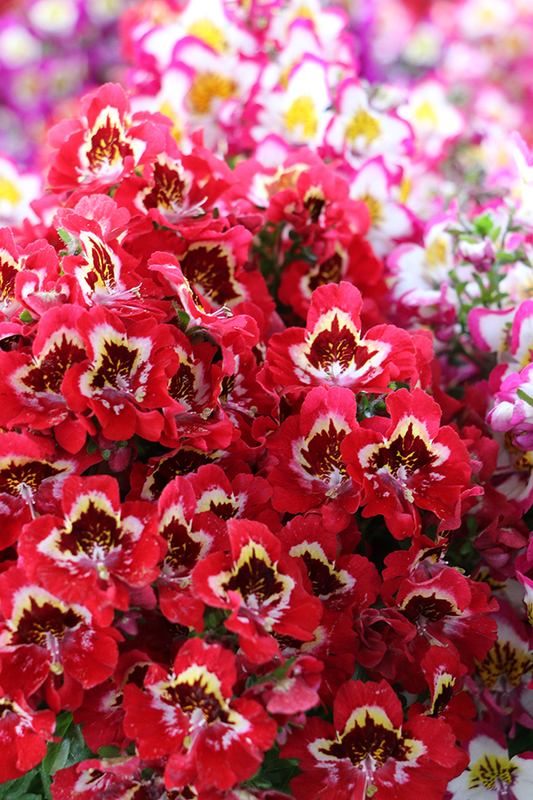 If you want to try, you must grow them in very bright light in the winter with the coolest temperatures and moist air. An unheated mudroom - one that stays above 35° F but below 55° F is ideal, or a garage, breezeway, glassed-in porch that does not freeze - anything with a slate or concrete floor - you get the picture. One could say this about all citrus, really. A house circa 1850 with radiators would be ideal. No wonder those Victorians had so much luck with camellias and lemons. Social media just loves 'easy and fun' hacks and DIY projects that oversimplify and over-promise. While well-meaning, must of the advice found is unrealistic and can be disappointing. 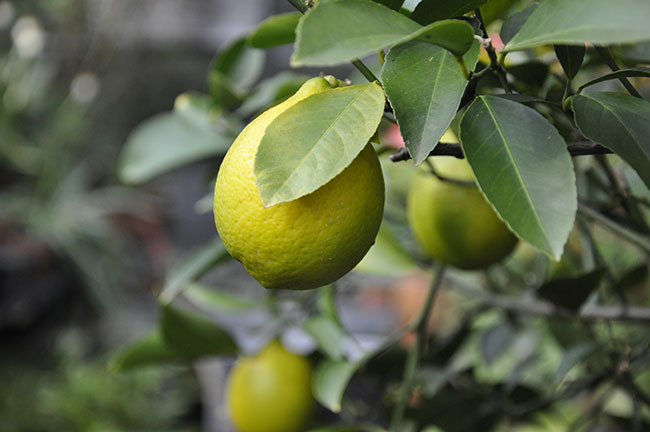 When it comes to growing citrus, never start one from seed if you want to be able to pick fruit. Start instead with a grafted citrus for many reasons, but mostly because of time and overall size. Citrus from seed may bloom, but it can take many years if not decades. Citrus from seed however is still a great children's project and there is little harm in letting them dream about picking oranges! There is this image that's been going around on mommy blogs and even some DIY gardening blogs that shows a cluster of lemon seedlings growing in a teacup along with the headline' Grow your own room freshener!' I'm not usually a grumpy dude but that image drives me crazy because it is such bad advice. Can you germinate a handful of citrus in a teacup? Sure. But the only way that it's going to act as a room freshener is if you totally smash the leaves until they are crushed. Is it long-lived? Of course not because crushing the foliage will kill every seedling. Don't get me started. For some reason, no one seems to call out these fake bits of advice, but I thought that if you don't know already, that maybe you would like to know the truth. Citrus seeds as a kids science project, however, a great thing. It's how I actually got the gardening bug - a grapefruit seed that was already sprouting in a grapefruit was planted in a larger pot of one of my mom's houseplants, and I was so excited when it germinated (I was in first grade) that I kept that plant growing until I left for college - when my parents threw the thorny beast into the compost pile. But just know that you'll want a good, grafted citrus (the rootstock is usually a Fortunella species, or something more hardy vigorous and allows a blooming branch - a clone, really - of a named variety that is proved to be delicious and fruitful, to bloom and set fruit as soon as the following year. Not to mention that the rootstock for potted citrus are specially selected to keep the grafted plant smaller, and room-sized. I should mention that sometimes a grafted citrus will send out a sucker, or a branch from below the graft. Always keep a look out for these, they will be more thorny and usually more vigorous than growth on the top. Remove them as soon as you see them. 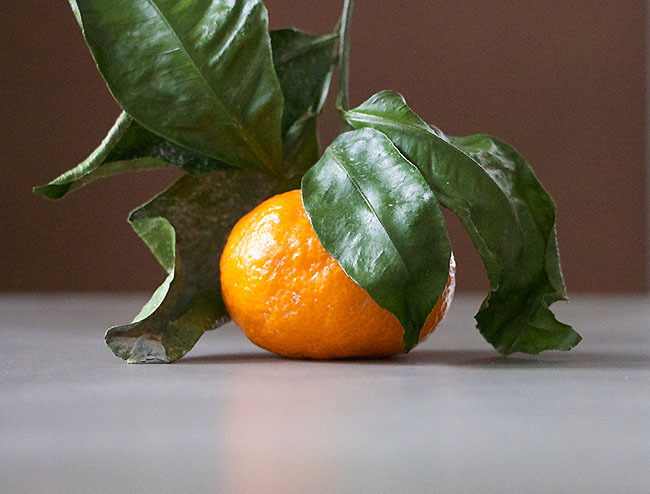 Calamondin oranges make a good option for indoor citrus. 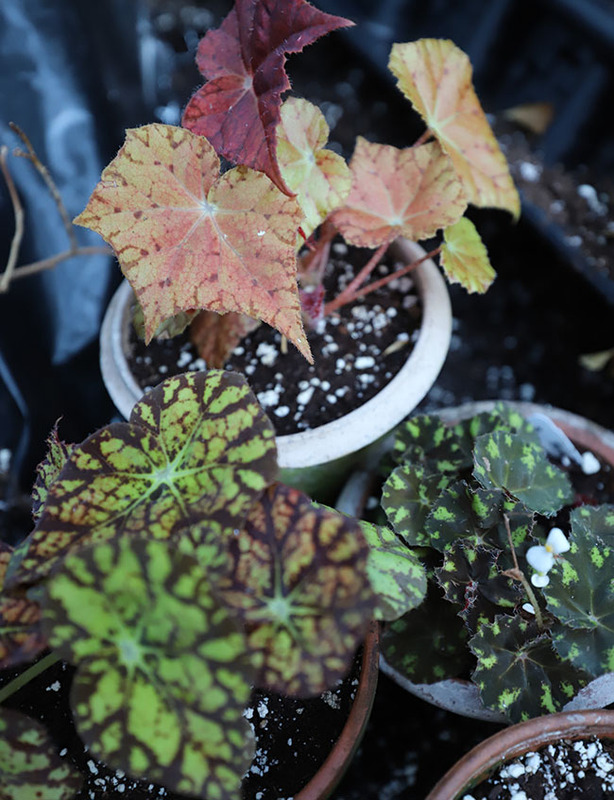 The variegated variety is very lovely both as a potted plant and as a decorative one that can be set outdoors for the summer where it will bloom and bear fruit the following winter. Another good indoor citrus is the 'Calamondin Orange', popular with Philapino folk, it has been a popular houseplant since the house plant craze of the 1970's. Look for the variegated one as it is the prettiest. The small fruit is edible, and not a bad substitute for lemon when added to tea. Like any fresh citrus, the oils in the skin alone make for a tasteful experience. I want to mention Kaffir lime leaf, which is a citrus as well - a very handy plant to keep in the house, and outside in the summer especially if you are an adventurous cook. One leaf added to cocoanut rice or Southeast Asian dishes and curries is transformative, and it makes the often unwieldy plant worth its real estate. Just allow it to grow large first before pulling leaves because if you are like me, all the leaves are used up before the end of summer! With one or two growth spurts a year, I really need a big tree of this one! In our central Massachusetts home which (is just over 100 years old and poorly insulated), it kind-of friendly to citrus as long as they are kept in the cooler rooms. 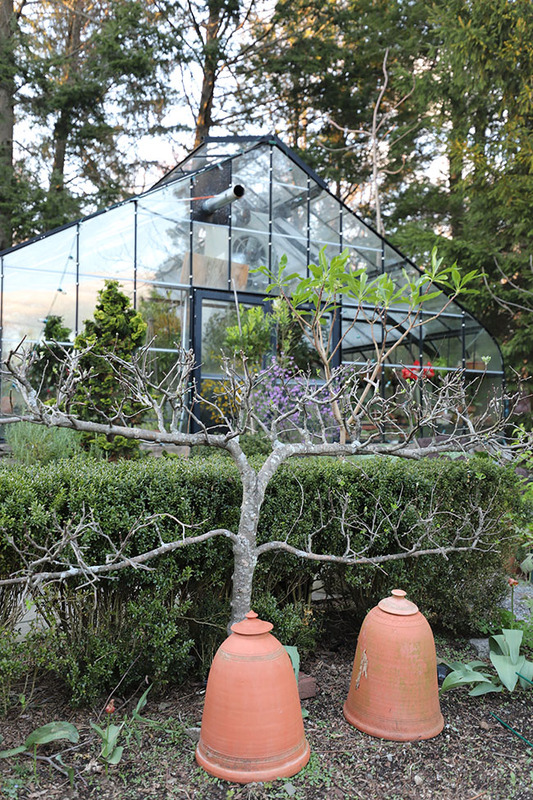 We even have this huge unheated room and with big windows, the ceiling is 16 feet tall and there is a concrete floor - exactly what so many potted citruses appreciate ( and camellias). Not everyone has that perfectly cold room, but some folks have a cellar with big windows or a glassed-in porch or a garage with big windows. Even an unheated bedroom will do. Many hybrid kumquats are now available, a(this one is Fortunella obovata 'Fukushu', or the Changshou Kumquat. All kumquats make delicious and fruitful indoor citrus as long as you can provide the cool conditions they desire. 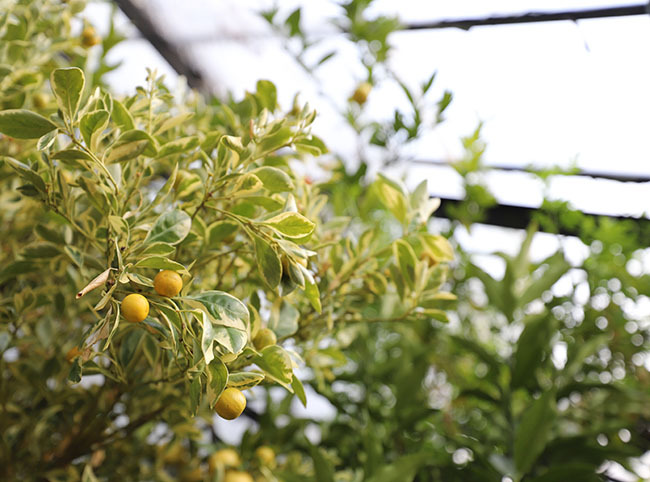 In our cool greenhouse we have enough kumquats to eat fresh all winter long. This one is one of the best (it looks like an orange) but it's round fruit are sweet, and yes - you always eat the peel on kumquats! Kumquats became our favorite though. Also maturing in the winter, the fruit is absolutely delicious when picked right off the tree and popped into your mouth. Nothing at all like store-bought kumquats - in fact, I would peel kumquats if I ever had to eat one, and I would never ever know what a treat they were until I ate one whole right off of the tree. The citrus also never seem to get insect problems in the greenhouse. Scale, mealy bug and particularly spider mite problems seemed to plague us every winter no matter what we do. In the cold, damp and sunny greenhouse, the foliage remains dark green and healthy. 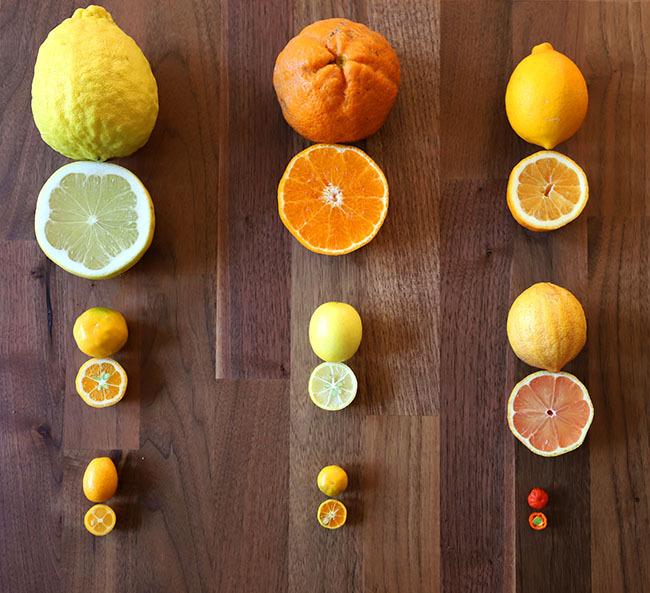 Citrons come in many shapes and sizes. More of a novelty than anything else, a football sized 'Etrog' can be an impressive show stopper. Beware though, these plants grow large (10 feet tall in a couple of years) and the thorns are deadly - I mean - poke your eye out deadly. I always have to set them in safe areas with no traffic from us or the dogs. Still, every year someone gets an arm scraped or a scalp scrath that requires stitches! IS a greenhouse essential? Of course not, and I'm not trying to make you feel bad about not owning a greenhouse at all (believe me, you wont want to pay the heating bills! ), but I wanted you to know what I have experienced when it comes to citrus culture, and it changed dramatically once I moved plants from the house into the greenhouse, and there are some learnings that came from that. Indoors, citrus certainly can be grown, but now I try to replicate what they experience in a northern winter greenhouse as best I can. 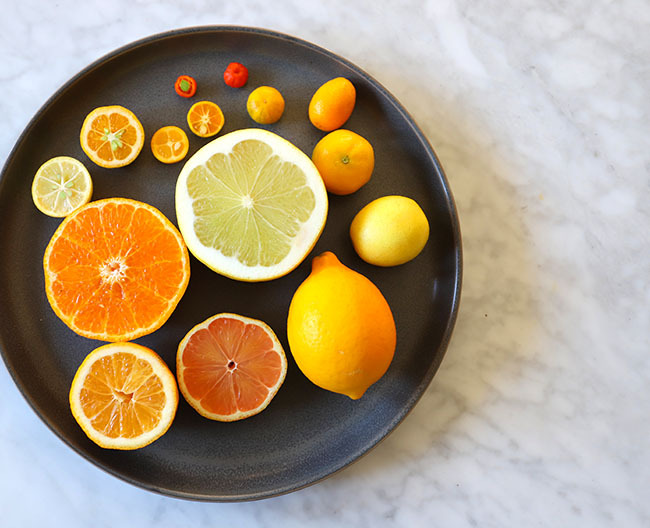 I think I always felt that citrus were southern plants, trees that liked heat and summertime temperatures, but really, they like a cool, Mediterranean climate, wet in winter and cool, but hot and sunny in the summer. I mean - no wonder they love California! Last weekends' pickings included 9 types of citrus from the greenhouse. Today we grow about ten citrus varieties in the greenhouse at any one time, and while everything isn't perfect (I lost 2 kumquat varieties this year and one lemon tree due to the hose being too far away and the heater burning one to a crisp), but each reason was due to operator error. I also house a few citruses from friends over the winter - a sort-of boarding school for citrus, but I always have to be careful as more often than not, they come covered with spider mites and mealybugs. The cold temps in there keep those pests at bay but I have to isolate the plants and scrub the stems and foliage. Would I grow citrus indoors again? Maybe, especially since the greenhouse is really getting too costly to heat (this may be the last winter I splurge on it), so plants could be relocated to a large unheated room that we have (the studio) where I think they would at least survive the winter just fine. 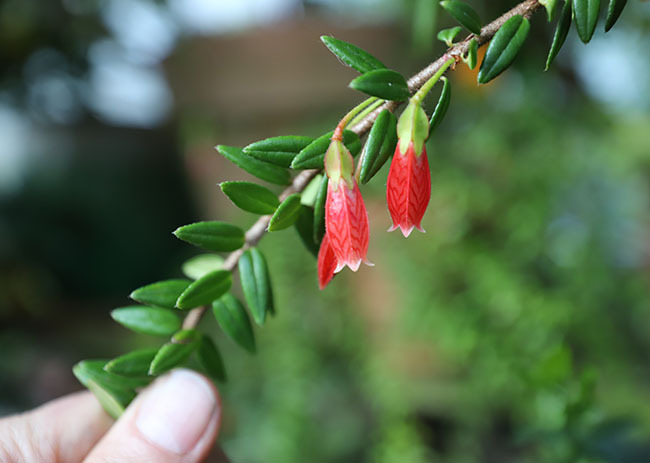 Fortunella hindsii, or the Hong Kong Kumquat has a near cult following by collectors, but not to eat, as the fruit contains just one seed or two, but is mostly skin and no larger than a large pea. 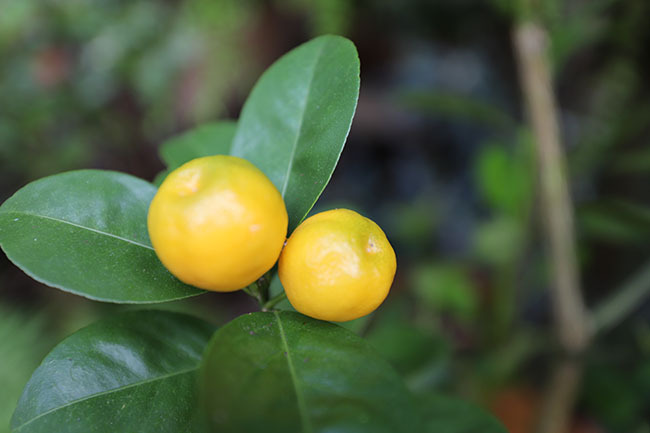 My favorite citrus happens to be any or all of the Kumquat varieties ('Fortunella species, and for named varieties, there are many), as well as the tiny, inedible Hong Kong Kumquat (Fortunella hindsii) which we grow purely for novelty sake. Who could ever resist its 1/4 inch 'dollhouse oranges' but be careful of its thorns - this wild species is thornier than a crown of thorns! A large topiary of this plant sits on a high bench in the greenhouse and I have to warn visitors to duck, or their head can become scratched. If it's hard to find, try asking for it at a bonsai nursery but then pot the rooted cutting up as a tree in a large pot and don't tell them! It's a popular bonsai specimen. Some of the most aggressive growers I've had include the pink variegated lemon (not very edible but the foliage is pretty) and the Australian Finger Lime, which quickly grew in the greenhouse into a large and thorny shrub, eventually having to be tossed as no one wanted to move it anymore. I did buy a rather expensive Mandarin orange that grows very edible and large mandarins, now trained as a sort of standard in a large tub, it's one of those citruses where I hate picking any fruit just because it looks so nice on the plant, but I've learned that picking fruit on all citrus is important especial;y if you want them to bloom again and on time. Many sites also advise one not to overpot citrus, and that they enjoy being potbound. I will say that we pot-up citrus the first few years into larger pots, especially if they are Logee's plants which often come in 2 to 4-inch pots. They are still young grafted plants and rather fierce growers but are watered every day or even twice a day at the nursery because they are pot bound. While citrus will always fill a pot with roots, most of these roots are at the surface, much like a camellia in a pot. Once settled into a 14-24 inch pot a grafted citrus will remain in that pot for much of its lifetime, but any citrus you buy in a 2- 4-inch pot will need an upgrade to a larger pot almost immediately. I would move small citrus into an 8 or 10-inch pot as soon as I get home from the nursery, and then once that pot is pot bound, move it to the14 or 24-inch pot where it will stay for at least 5-10 years, with biannual refreshing the outer soil. Citrus has surface roots which will eventually take over the top of the pot, making a pot look like it's pot bound when it actually is not. I topdress most citrus once a year with a bit of new soil (always using Promix BX or PRomix HP (High Porosity) which I think these acid-loving plants appreciate. The plants are fertilized only in the summer with a balanced chemical feed (RapidGro) as they like high nitrogen during foliar growth, and then hit once or twice with a commercial citrus feed. Every year we get yellow leaves because of Iron deficiency or boron deficiency, which is when we repot a plant usually into the same pot, but with fresh soil. 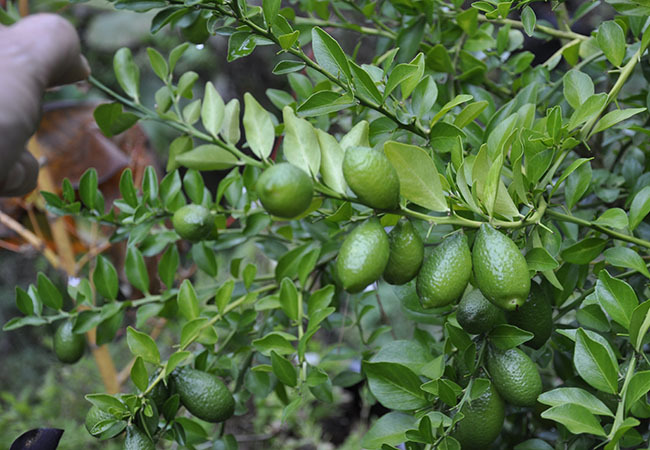 Fertility with citrus is tricky, especially with container grown plants as most citrus fertilizer is sold for use outdoors, on trees planted directly into the soil. I prefer a water-soluble or time release feed (or both) on potted citrus, but soil chemistry factors are as well. All peat or coir based potting mixes will change physically over time as they decay, affecting pH and soil structure so they often need refreshing. Many recommend a low analysis like 5-2-6 which is similar to the Espoma citrus food but be careful if using this in a pot as it can burn roots near the surface. If using, sprinkle the granules on in the summer on top of fresh soil that you've added to the pot. Miracle-Gro for acid-loving plants works well too but look for high nitrogen and high potassium. As for troubles with insects, unfortunately, scale and spider mites are difficult to control without insecticide, so if you plan to eat your fruit of have issues with using a systemic insecticide, the only option is to toss your plant and get a new one. Mealybug, which difficult to treat without chemicals can be scrubbed off carefully, and then the soil replaced as best you can and hope for the best. I have never, ever had any luck with any organic insecticides with these pests on citrus, but as I shared with you earlier, our plants in the cold greenhouse never seem to get any pests which tells me that they are healthier if grown in damp air at low temperatures. 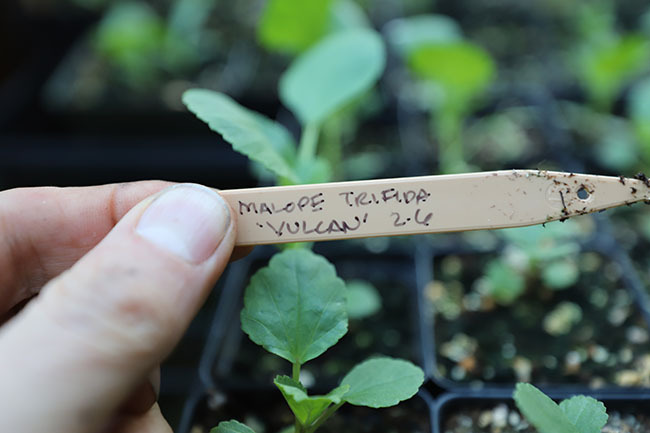 A note about the cold greenhouse here - I keep our greenhouse set to 38 - 40 degrees F in the winter, which is how cold it gets on the coldest nights - even if it is -10° F outside. Sure, it may get colder near the floor but on a sunny day even in January, the air temperature can reach 65 or 70° F. Most of the mature citrus are in large 24-inch pots which are set high in the greenhouse where it is a bit warmer (this bench is above my head). This provides a bit more warmth and even bright sunlight as the fruit can ripen near the glass. I still lose a citrus plant or two each year in the greenhouse but not because they are difficult to maintain, it's due to my neglecting them. 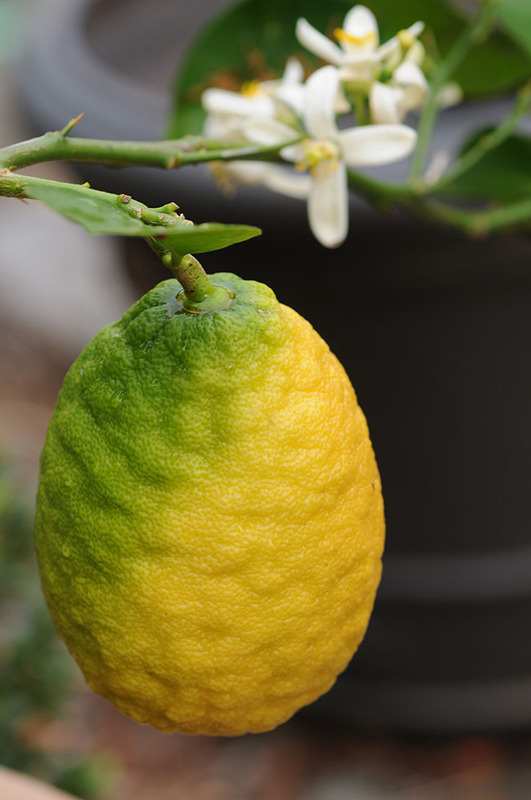 It's easy to forget to water a lemon that sits on the opposite side of a walk or move a plant to the wrong place. Even though we've experienced a couple of freezes (when we've run out of fuel) this has done little harm to the trees. One night last January the furnace ran out of fuel and the air temperature dropped down to 20° F for a few hours, but there was no visible damage to the plants. Any lower and the roots might have been killed, but what did a few plants in was that once the furnace came on, hot, dry air blowing from it killed two large Kumquat plants because I had temporarily moved them to a new part of the greenhouse so that they would be further away from the wall - but they then sat right in the path of the furnace fan.